In an impressive increase from years past, 35.3 percent of women in the United States had completed four years or more of college in 2018. This figure is up from 3.8 percent of women in 1940. 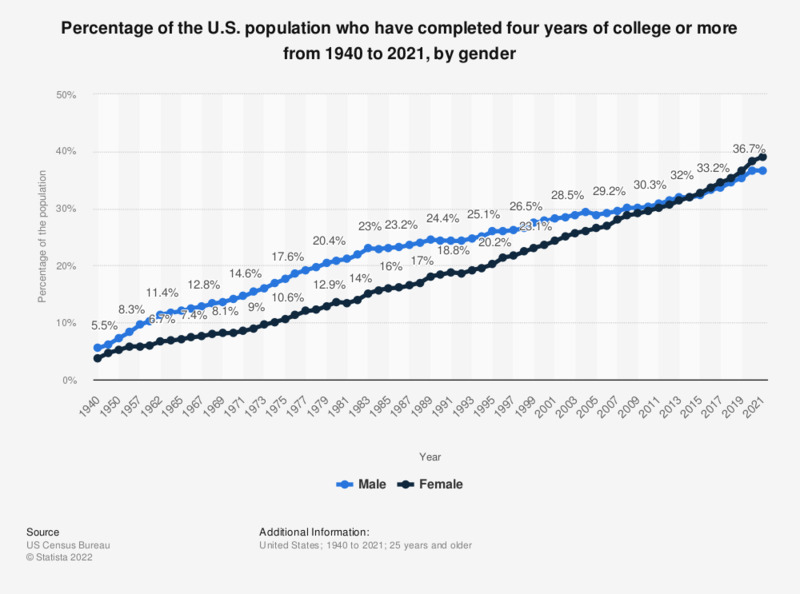 A significant increase can also be seen in males, with 34.6 percent of the U.S. male population having completed four years or more of college, up from 5.5 percent in 1940. In the United States, college students are able to choose between attending a 2-year postsecondary program and a 4-year postsecondary program. Generally, attending a 2-year program results in an Associate’s Degree, and 4-year programs result in a Bachelor’s Degree. Many 2-year programs are designed so that attendees can transfer to a college or university offering a 4-year program upon completing their Associate’s. Completion of a 4-year program is the generally accepted standard for entry-level positions when looking for a job. Factors such as gender, degree achieved, and the level of postsecondary education can have an impact on employment and earnings later in life. Some Bachelor’s Degrees continue to attract more male students than female, particularly in STEM fields, while liberal arts degrees such as education, languages and literatures, and communication tend to see higher female attendance. All of these factors have an impact on earnings after college, and despite nearly the same rate of attendance within the American population between males and females, men with a Bachelor’s Degree continue to have higher weekly earnings on average than their female counterparts. Everything On "Higher education graduation in the U.S." in One Document: Edited and Divided into Handy Chapters. Including Detailed References.